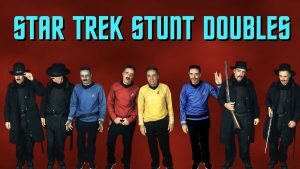 How many people does it take to make a Star Trek fan film? Five? Ten? Fifty? A few have listed over a hundred cast and crew members in their credits. But what if there’s just ONE guy? One guy doing all the camera work, costuming, make-up, writing, direction, lighting, sound, editing, compositing, visual FX…and even playing all of the roles? 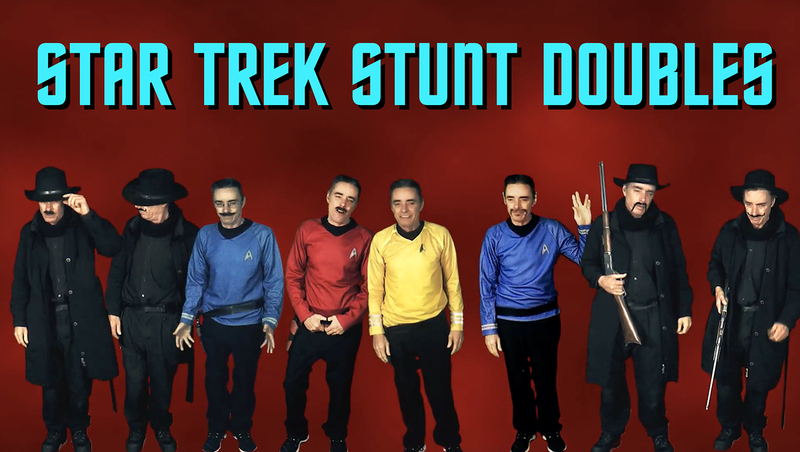 Meet MrBonk85 (that’s his YouTube handle) and his STAR TREK: STUNT DOUBLES fan series. I first discovered this fellow a few months ago when he released his version of the TOS episode “Spectre of the Gun” (see below). It compressed the classic episode down to just 5 minutes, a mix of recreations of scenes using original dialog with unexpected flourishes of humor. And this one fan was was playing all of the roles himself! It was very surreal. This initial fan film effort was followed a couple of months later by a similar take on “Where No Man Has Gone Before” and about a week after that by “This Side of Paradise.” Again, one guy appeared as every character—even female characters—green screen composited against TOS backgrounds with TOS music. Needless to say, I just had to know more. So I reached out to this gentleman and asked if he’d care to do an interview. I learned from his response that Mr. Bonk’s real name is Paul (there are no credits in any of the episodes), and he was happy to chat with me.